Yesterday I mentioned Animal Crossing, a computer game for Nintendo consoles. 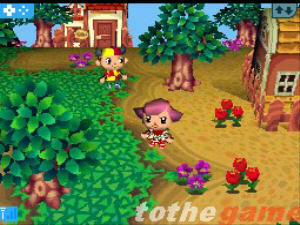 You interact with cartoon animals and create a thriving village. The animals look up to you as a main character, and will remember things you do and say, save some of the letters you have sent them, perhaps wear clothes with patterns you have designed and so on. When you connect these handheld machines wirelessly, others can visit your village and you theirs. Animals may move from one to the other and take with them their memories of you. This way, your influence spreads to other villages (and they influence yours, too). Isn't this how we already work? The animals are the memes or complexes in our own psyche, a village in our own brain. We interact with our own thoughts, a constant inner dialog (or sometimes it seems to be a whole club). We seem to be an island, a closed system. It concerns no one else what I think in my head. But in fact we are connected a lot. Even the way we look at someone may convey some of what goes on in our mind. Along that line of sight a few small "animals" jump from our mind to another. The others move on and forget who they saw smile or frown, but the smile or the frown follows them. And so with many other things. A kind or unkind word, sneaking in the line or holding open a door, not to mention the times we talk openly with each other. We are all connected. Therefore, the content we create in our own minds may be shouted from the rooftops before we know it. Patterns that we are barely aware of are formed again in other minds as they first were in ours. It may seem inconsequential, what we talk with the pig about in the enclosed village of our skull. But somehow, mysteriously, one day it leaks out, and a small bird carries it far and wide. When Jesus told the people that a man should not even look at another's woman to desire her, he wasn't trying to make it difficult for the listeners. (Although it can certainly be difficult.) Likewise when he compared anger to murder. Rather he was aware that what we do in the solitude of our mind is real, albeit in a different and indirect way, and can make things easier or harder for us and others in the future. Our thoughts become our character over time, until it can no longer be hidden. By knowing beforehand that we will be visited, we may care for our inner village and not use it as a garbage dump. In the long run, this will not be regretted. Visit the archive page for the older diaries I've put out to pasture. I welcome e-mail. My handle is "itlandm" and my domain is "chaosnode.net".